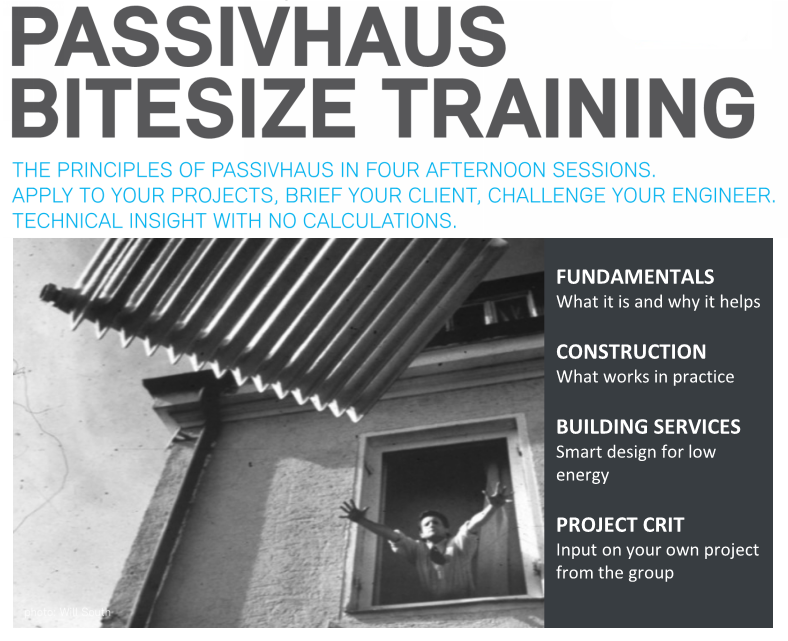 These half-day sessions offer insight into all the main principles of the Passivhaus Standard and what makes a good low energy, comfortable building. The trainers are experts who are successfully designing and building Passivhaus in UK - among others, Bill Butcher, Alan Clarke, Sally Godber, Nick Grant, Eric Parks, Mark Siddall, and Passivhaus Certifiers Will South, Mike Roe and Peter Warm. Assisted by Passivhaus Designers Piers Sadler and Tom Dollard. These sessions are being run in conjunction with AECB Carbonlite & The Green Register. This half-day session introduces the principles behind the Passivhaus standard (thermal comfort!) and the differences from normal construction so that everyone on the design team can understand the process. At the pre-planning stage, the focus is mostly on how the choice of massing/shape and glazing/fenestration can make significant differences to how easily the design can meet the Passivhaus target. Post planning permission, particularly at detailed design stage, the emphasis shifts to ensuring that the actual construction is as close to the theoretical thermal performance as possible. In the UK, this gap between theory and practice has become known as the “performance gap”. The main culprits are examined: lack of airtightness and problems with insulation, such as a lack of understanding of thermal bridging and convective bypass, and how these impact negatively on the thermal envelope. The requirements for all-seasons comfort are also discussed: summer overheating can be dealt with by design if there is an understanding of the processes: seasonal shading, natural and/or mechanical ventilation, together with care over uncontrolled internal heat loads can deal with most problems without recourse to cooling in this climate. Minimizing summer overheating is a core part of the Passivhaus target. Finally, investigate the support and resources available in the UK, from Passipedia.org to Passivhaus designers and building certifiers working in the UK. Register via the online booking form. Unfortunately the Newcastle events have been cancelled at short notice.